Everybody needs a little sunshine in their lives, especially at the thin end of January, facing into the dreary bleakness that is February. It’s damp and cold and wet outside; I need a little cheering up. 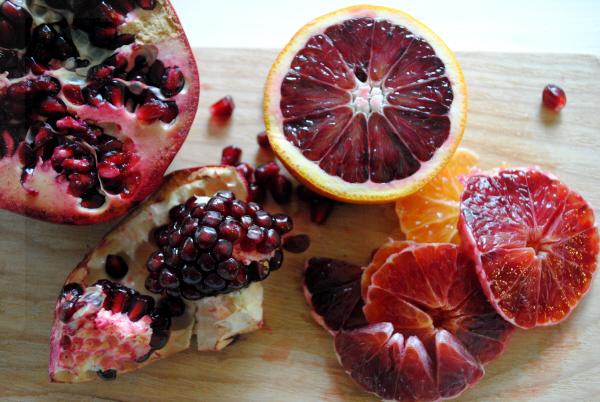 And some deep, dark red blood oranges. We eat an inordinate amount of citrus fruit at the cottage – regular sweet oranges and tangy pink grapefruit peeled at the table after dinner, lemons and limes to brighten everything from lentil Harira to chicken, December boxes of clementines for eating by the fire as an antidote to Christmas richness. Sevilles – once – for marmalade. But these bloody beauties are extra special. Sweet and tart all at once, with a tantalising hint of summer berries to come, they’re irresistible. They will only be in season for a short while so gorge while you can. And then, having eaten your fill, try this colourful Sunshine Salad, loaded with super bright, super tasty, superfoods like those oranges, pomegranate seeds and spinach. To make it into more of a main course, add cubes of feta, some soft goats’ cheese or serve with a warming bowl of soup on the side. Bulgur wheat (or bulgar or bulghar), made by precooking and coarsely grinding wheat berries, is a staple in this house. I normally buy it in Middle Eastern shops, Mr Bell’s in the English Market or health food shops and it comes in different textures. In the summertime, I choose the fine variety, which only needs to be soaked in boiling water before using in salads like tabbouleh or interchangeably with couscous. The medium and coarse grinds need a little longer to cook but are great in a mushroom pilaff or as a starchy side for a tomato-based Chickpea and Chorizo Stew or Greek Bean and Tomato Stew with Feta. I often cook more than necessary for one meal, store it in the fridge and use it in salads like this. Shortcuts: I get my roasted red pepper from a jar, or you can follow roast-your-own instructions here. This is the kind of salad I often make with leftovers. Try using other roasted vegetables like carrots, beetroot or sweet potato. Roast the squash: preheat the oven to 200°C (400°F). Toss the squash cubes with 1 tablespoon olive oil, salt and pepper then spread out on a flat tin and roast for 25-30 minutes until tender and slightly caramalised. Allow to cool. Cook the bulgar wheat: bring 400mls of lightly salted water to the boil, add the bulgur, put on the lid and simmer over a low heat until the water is absorbed and the grain is tender, 15-20 minutes. Allow to cool. Make the dressing: put all the dressing ingredients into a jar, season and shake well. 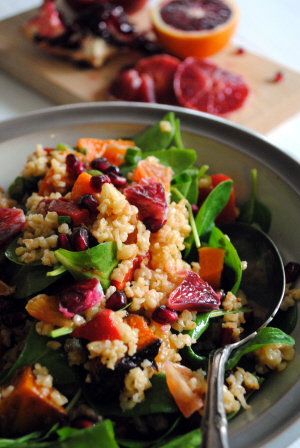 Assemble the salad: place the cooled squash and bulgur into a large bowl with the pepper strips, spinach, orange. spring onions and pomegranate. Pour over half the dressing and toss carefully. Depending on how juicy the oranges are, you may not need all the dressing; keep it for pouring over grilled fish or a selection of roasted vegetables. Serves 4. It wilts a little in the fridge but keeps for a couple of days. Make sure to bring it to room temperature before serving. Next story The big reveal…it’s a book!